Christian Schilling earned Best New International Director distinction at the Kinsale Shark Awards. A scene from Bodyform/Libresse's "Blood Normal," which won the Grand Prix and a Creative Bravery Award at the 56th Kinsale Shark Awards and Festival. “Blood Normal” shows women dealing with their periods in real-life scenarios, breaking taboos about dealing with menstrual cycles. Daniel Wolfe via Somesuch directed the piece, part of a campaign in which the feminine care brands also commissioned aspiring filmmakers to make short films that openly reference periods. Besides AMV BBDO’s strong showing, Kinsale also saw BBDO New York earn Agency of the Year distinction. And the Network of the Year mantle was bestowed upon BBDO. Meanwhile, another Creative Bravery Award went to Mother for KFC’s “FCK.” And Rothko scored the Irish Agency of the Year designation. Carol Freeman and Christian Shilling won, respectively, Best Irish New Director and Best New International Director, honors which were voted on by the festival audience. Freeman was recognized for The Bird and The Whale, an oil paint on glass animated film in which a baby whale separated from his family discovers a caged bird, the sole survivor of a shipwreck. Together they struggle to survive at sea. Schilling scored with three films: Kill the Noise, Pomegranate, and The Man with a Coin. The latter--an offbeat comedic piece in which a man repeatedly decides his fate with the flip of a coin--earlier this year earned Schilling a slot in SHOOT’s 2018 New Directors Showcase. Gold film winners included Riff Raff Films for Nike’s “Nothing Beats A Londoner” out of Wieden+Kennedy London, and VCCP for Cadbury’s “Beach Huts” and “Coast.” James Rouse via Outsider directed the Cadbury fare while Riff Raff’s Megaforce helmed “Nothing Beats A Londoner” which back in February earned SHOOT’s Top Spot of the Week distinction. Film craft golds went to Rothko, Motherland, Nexus, Sonny London, Framestore, MPC, Riff Raf, Blur Films and BBDO NY. Best short film went to Wren Boys, directed by Harry Lighton, for Try Hard Films. 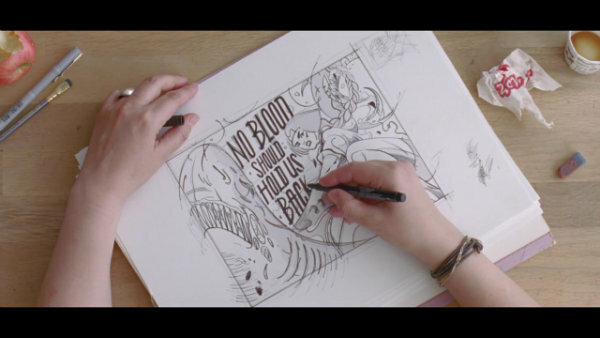 In design, The Line Animation and Energy BBDO won for “Gucci Hallucinations” and “Prescribed to Death,” respectively. Seven golds were awarded for PR and Interactive including Rothko’s “JFK Unsilenced,” BETC’s “Save our Species” for Lacoste, and AMV BBDO’s “Trash Aisles” for LadBible/Plastic Oceans Foundation. Kinsale winners this year spanned the U.K., Ireland, the U.S., Canada, Thailand, Germany, France, Belgium and Sweden. For a full list of winners at the 56th Kinsale Shark Awards & Festival, click here. The Kinsale Shark Awards has launched the Creative Bravery Award, a new accolade for this year’s season and festival.